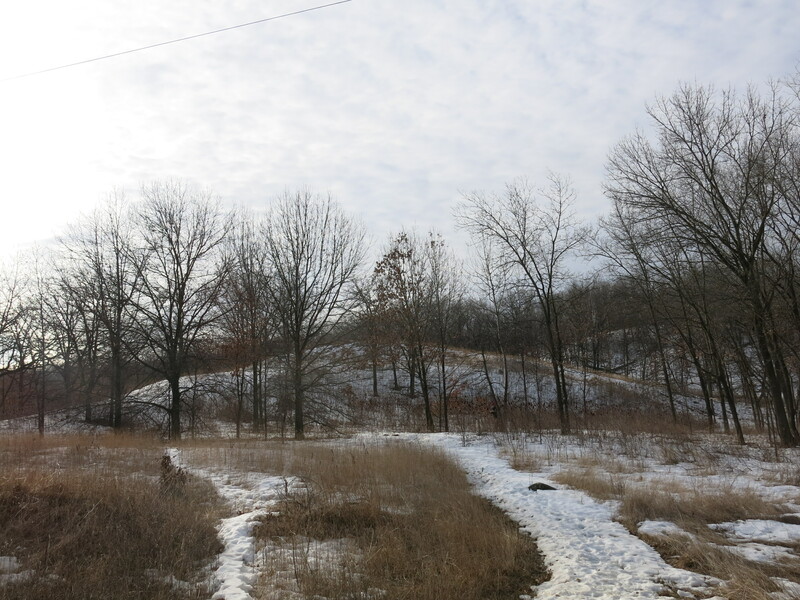 Little Kestol Prairie is a secret nestled in the rolling moraines and oak savannahs of the Kettle Moraine Oak Opening State Natural Area (SNA). Well, OK, it’s not a secret anymore, it’s outlined by the black circle just south of Young Road on the map below. 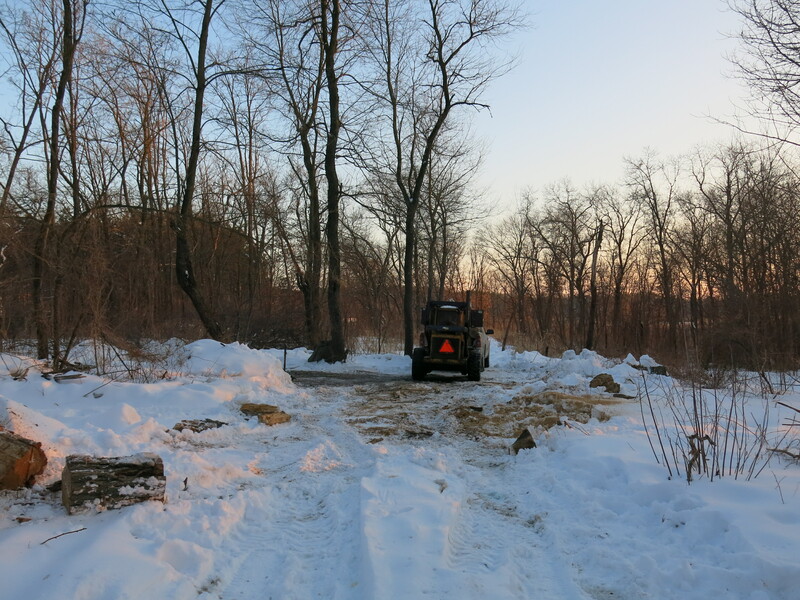 Zach Kastern has known the secret of this remnant, dry prairie, for some time and has been working to keep invasive species, as well as fast spreading native woody trees and brush, from overtaking it. 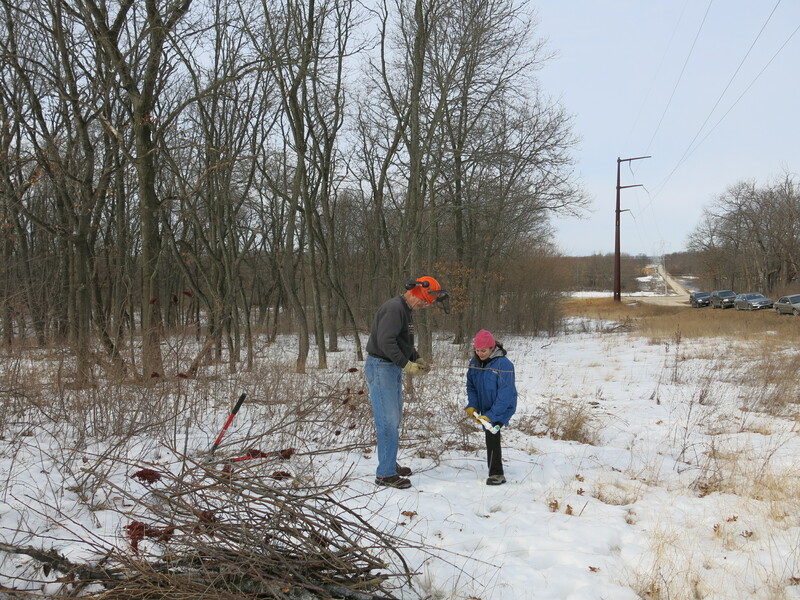 So when Jared Urban, the DNR’s SNA volunteer coordinator, asked him for a location for the March workday, Zach was quick to suggest it was time to reveal the Little Kestol Prairie. (Ed. note. After I posted this, Zach commented that the prairie was probably named after Joe Kestol. The Joe Kestol house on Territorial Road was built when the Kestol family came from Norway about 1846. It has been occupied by Joe Kestol until 1993, when he went to live at a Retirement Home. J. W. Kestol refers to the late James Kestol, my father, who was a teacher in Janesville, Wisconsin. The farm, about 200 acres bordered by the state forest, has been in the Kestol family for 105 years. 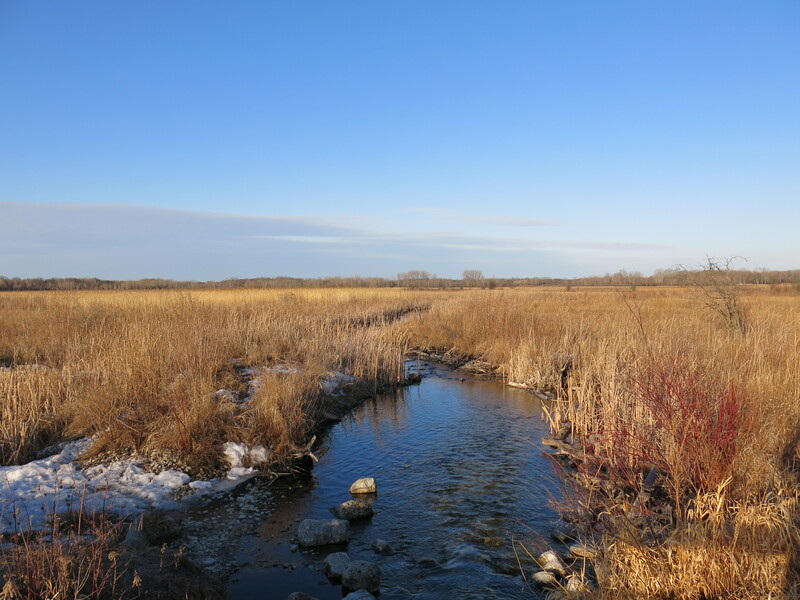 Little Kestol Prairie is named for James Kestol, not Joe Kestol. Joe Kestol, deceased, was James’ brother. He owned the farm on Territorial Rd, a sesquicentennial farm that has been in the family since 1851. 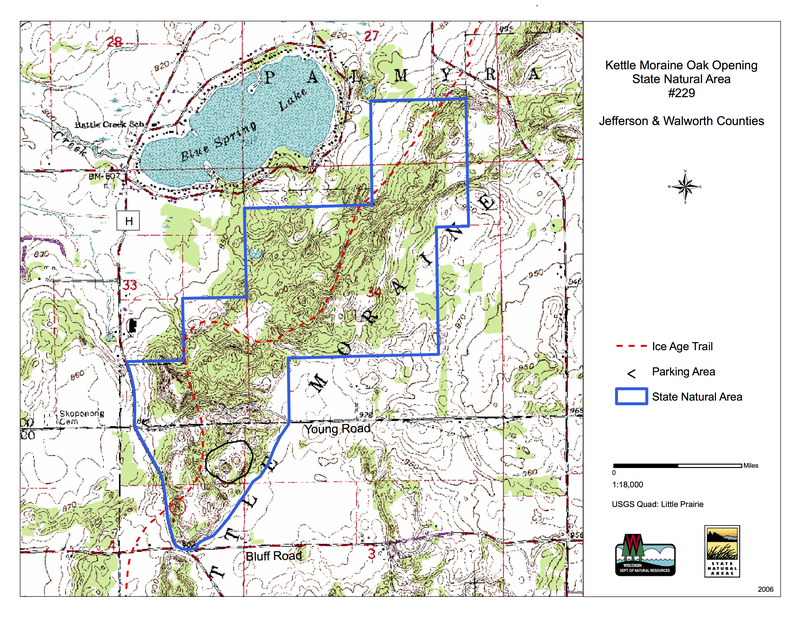 The Little Kestol Prairie is also mentioned in the Walworth County Land Use and Resource Management Plan.) 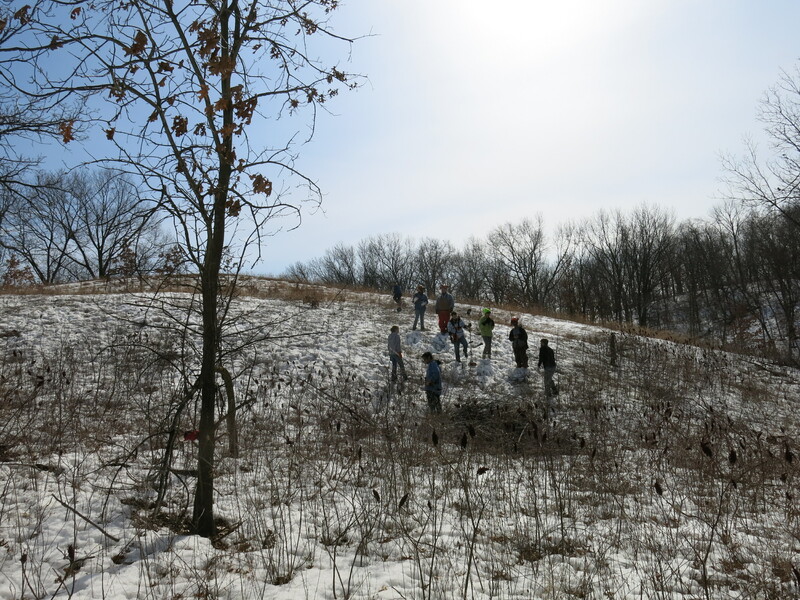 Listen to Zach share the secrets of this ecological remnant and what he hoped we could accomplish on a beautiful Saturday morning. A great crew of volunteers including: members of S.A.G.E. 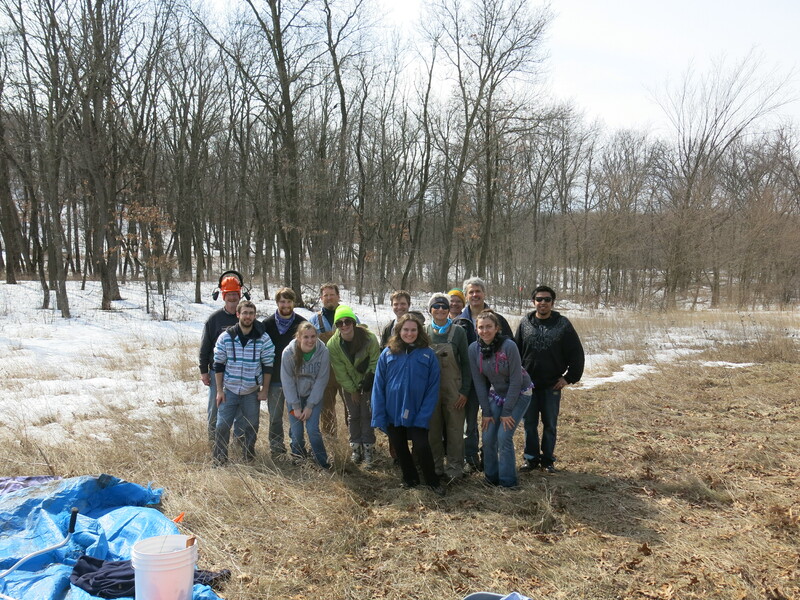 (Students Allied for a Green Earth) at UW Whitewater, the Kettle Moraine Land Trust, and free agents like Don, Brandon and Ginny (thanks for the cookies) contributed to a very successful workday. My day started at The Springs, where I stopped to get some “world class” spring water to drink. When I arrived, Zach, Jared and Ginny were reviewing the plan for the day. 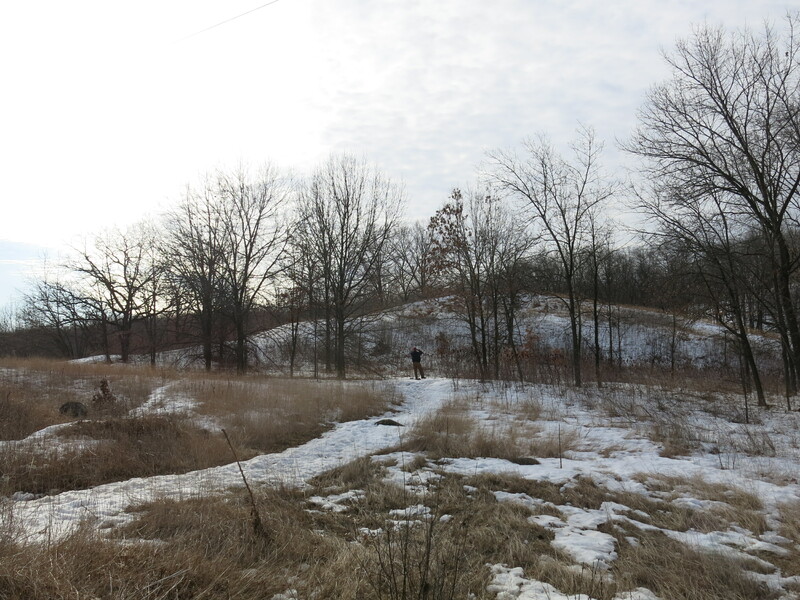 Below, Zach documents Little Kestol Prairie with some before photos. 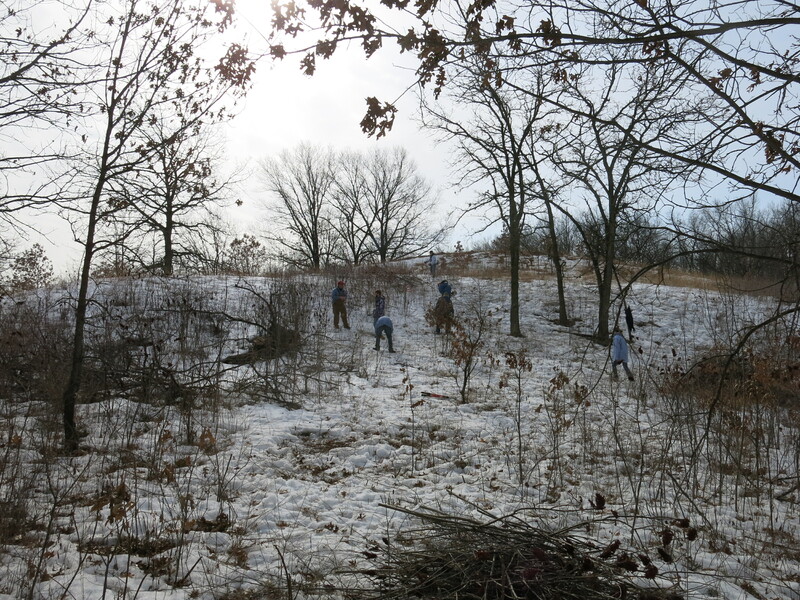 Soon we were hard at work on the slippery, snowy, wet hillside. 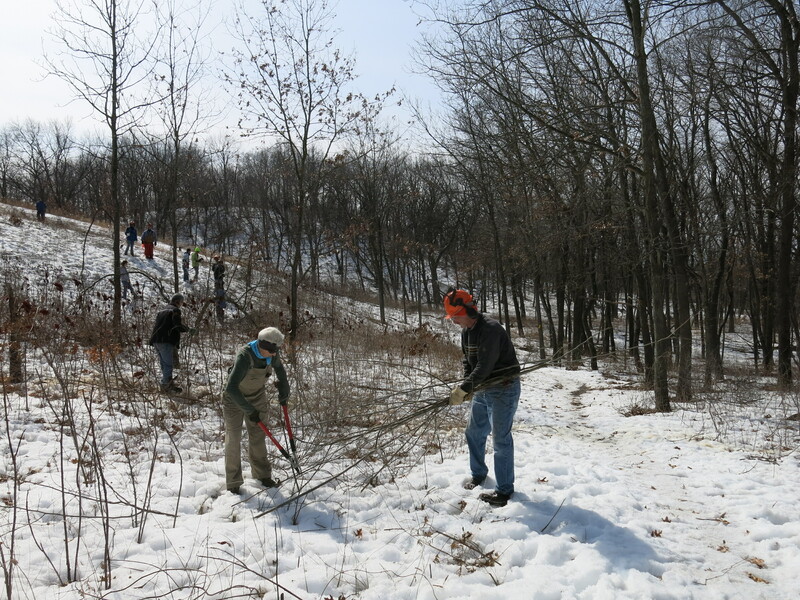 Herb and Stephanie cleared an area at the bottom of the hill. I spent the morning following Brandon, who was swinging a brush cutter, with one of Jared’s patented poison daubers, and that was a nice change for me. Zach flagged the hazelnut, hickory, oak and other “keepers” so the brush cutters (Rebecca and Brandon) had to be very discriminating. As the morning warmed up, even the snow on the north side of the hill began to melt. Although many of us got cold, wet, feet, nobody bailed out! Ginny and Herb double team the brush. 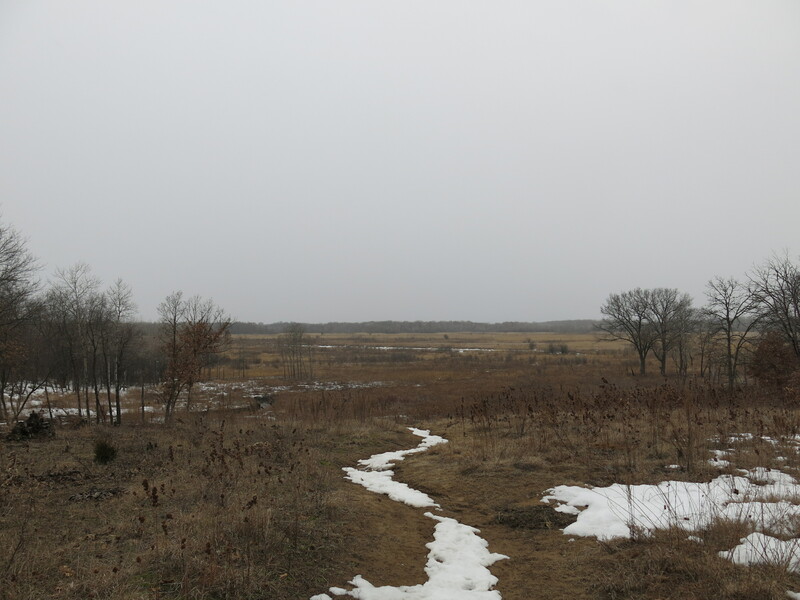 Here are some perspectives from the top of the Little Kestol Prairie. I spent the afternoon back at The Springs harvesting black locust firewood for my upcoming camping adventures at My Shangri-La. I ran into Carl Baumann and John and Sue Hrobar, who reported seeing American Woodcocks by the new spring we uncovered in the Buckthorn Alley (I forgot to mention the Sand Hill Cranes returned this past Monday, the 10th.) 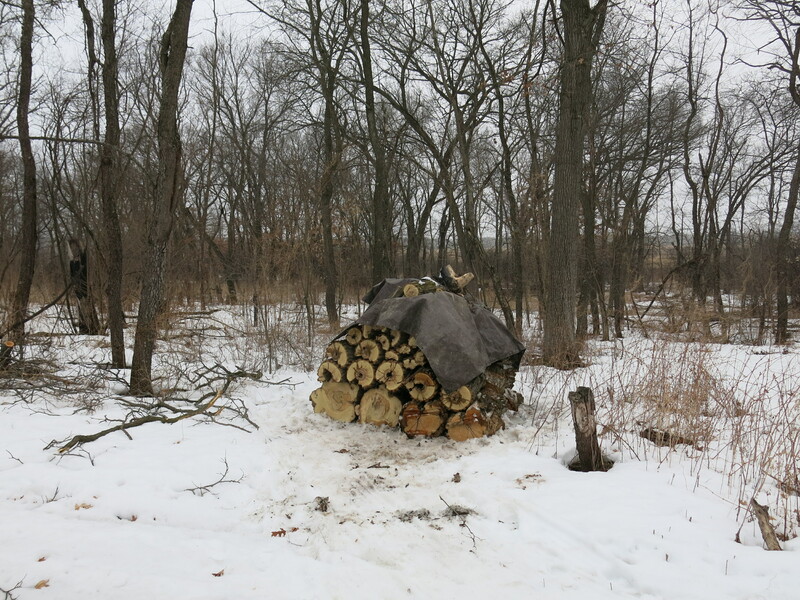 Carl was picking up some black locust and cherry firewood for his new friend Marty, who lives in the neighborhood and, like many others, ran short of firewood this season. Nice work Carl! That’s Marty in the skid steer loader and Carl in the back of the truck. See you at The Springs! 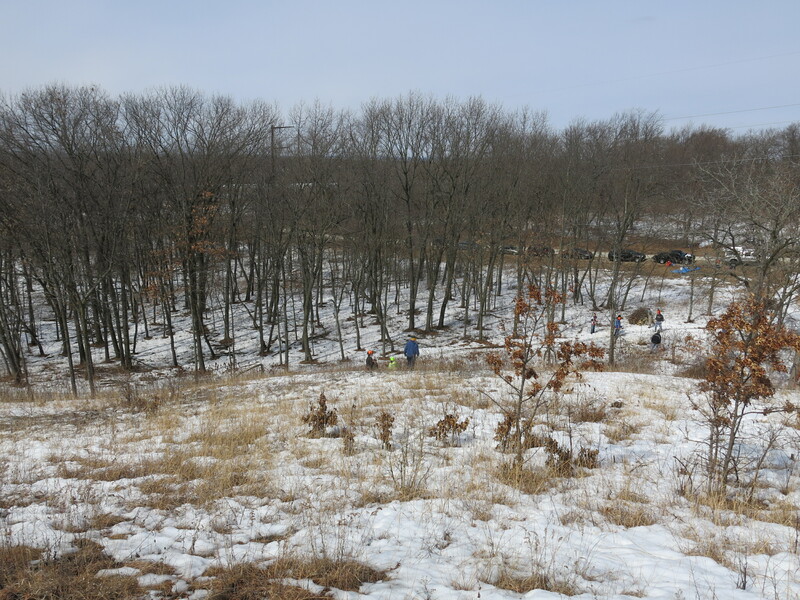 This entry was posted in Endangered Resources Program, Kettle Moraine Oak Opening and tagged Bureau of Natural Heritage Conservation, Carl Baumann, Ginny Coburn, Jared Urban, Kettle Moraine Oak Opening, Little Kestol Prairie, S.A.G.E, Zach Kastern by paulmozina. Bookmark the permalink. My theory on the name given to the remnant is that it comes from the Kestol family that had or has farmland in the area. There is a barn on Bluff road nearby that has “J.W. Kestol” still painted on it and I’m familiar with another Kestol homestead just around the corner from my house which is about 9 miles away. Thanks Zach! I’ll have to update the spelling of the post title and search the internet again. Just a theory, I could be totally wrong too. Hi Zach. I found some historical references to support your theory and added them to the post. Thanks for helping me improve the accuracy of the story! Kestol prairie was named after the guy who we bought that site from. I can’t recall his first name and would have to check my notes to find out. Mr. Kestol was going to sell that prairie to another person who was going to build a house on the site. In fact he was going to build the house right into the side of the hill where the prairie exists!! It was sort of ironic that this future home owner wanted to do something for the environment (low energy use) would destroy such a beautiful site. We were very fortunate to get this site. Mr. Kestol signed the offer right there on the hood of his car. The State Forest Superintendent was Bruce Chevis and I was also there. please unsubscsribe me from this email address. I have subscribed using a different (new) email address.